Two days after trading away defenseman Dennis Wideman, the Boston Bruins re-signed rapidly developing blueliner Johnny Boychuk to a two-year contract. In keeping with club policy, no financial terms were disclosed. "He made great strides this year," Bruins General Manager Peter Chiarelli said in a conference call with the media Thursday. "He was patient before he got into the lineup. He learned our system. He's got a dimensional shot. He competes. He's got size. The biggest thing that I saw was that he's improved from being the defenseman of the year in the American League, being our seventh 'D' to start, working his way into our lineup patiently, but learning along the way." Wideman, whom Chiarelli said "is one of the best puck-moving defensemen in the NHL," went to the Florida Panthers along with the No. 15 pick in the Entry Draft, for forwards Nathan Horton and Greg Campbell. Horton will likely play right wing on a line with center Marc Savard while Campbell will likely be the fourth-line center, replacing free agent Steve Begin, who did not receive an offer from the Bruins to return. "When they moved Dennis, it made an opening for me to jump into the top-four (defensemen) and play a bit more minutes than being a No. 5- or 6-guy. It sent a message to me to be a top-four guy and, even if I'm not, I want to play like I am," said Boychuk, who could have become an unrestricted free agent on July 1. Although Boychuk, 26, was the Colorado Avalanche's second-round pick (No. 61) in the 2002 Entry Draft, last season was his first extended opportunity in the NHL. The Avalanche tried to turn him into a forward over parts of two seasons before returning him to defense, played him four games in the NHL in 2007-08 and then gave up on him, trading him to the Bruins for Matt Hendricks on June 24, 2008. The Edmonton native quickly showed the Bruins that they'd made a great deal. Boychuk was named the AHL's best defenseman during the 2008-09 season when he scored 20 goals and added 46 assists for 66 points for the Providence Bruins. He played one game for the parent club that season. Boychuk, who is 6-foot-2 and 229 pounds, was with the Bruins leaving training camp last fall but played in only three of their first 26 games before a two-game conditioning stint in Providence in which he scored one goal. Beginning with the Dec. 5 game against the Toronto Maple Leafs, Boychuk played in every game thereafter except for missing five February games with a broken orbital bone after being hit by a shot and a March game that he missed due to the flu. Boychuk was partnered with defensive leader and captain Zdeno Chara for most of the second half of the season and really blossomed defensively and offensively. He had 5 goals and 10 assists for 15 points in 51 games and was plus-10 with 43 penalty minutes. He was even better in the Stanley Cup Playoffs, posting 2 goals and 4 assists for 6 points in 13 games with 6 penalty minutes and an even plus-minus rating. "It was a great playoff experience for me," Boychuk said. "In the first two rounds, I thought I played really well. I'm still kind of shell-shocked that we lost when we were up 3-0 (against the Flyers.)" Bruins coach Claude Julien put ever-increasing amounts of responsibility on Boychuk, and he responded well. Boychuk was second in ice time on the Bruins in both the first-round series against the Buffalo Sabres and the second-round series against the Flyers, averaging 26:10 per game. He led the Bruins during the playoffs with 39 blocked shots and was fifth with 29 hits. Boychuk’s special-teams time more than doubled in the playoffs, and with Wideman gone, he said he hopes to see more power-play time in 2010-11. 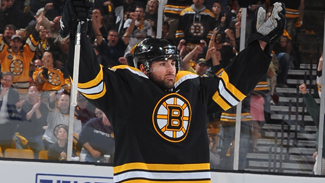 "Being on the power play, you're counted on to score goals or get assists," Boychuk said. "Create something on the ice, at least. Hopefully, I'll be on the power play and get to use my shot."